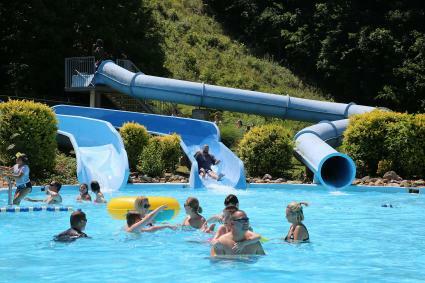 Located in Jonesborough, Tennessee, the Wetlands Water Park is a small, family-friendly theme park that offers various attractions and lounge areas. It could be a great option for your next birthday party too! 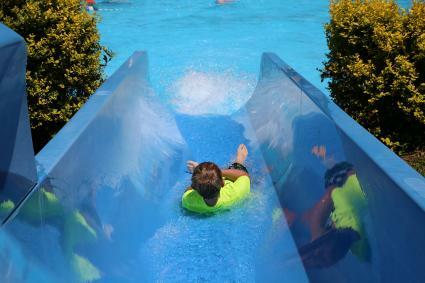 The water park features several slides, including one 80-foot enclosed flume slide and two open flume slides, one at 100 feet and the other 200 feet. The height requirement for the three large slides is 48 inches. For those with children who are close to the height requirement, Wetlands Water Park advises that you should take your child to customer service for an official measurement. If they are tall enough for the large slides, they will receive a wristband that will allow them to ride the slides all day. There are also more mild options, like the lazy river, for younger kids or those looking to relax. Other options include the zero-depth wading pool and children's otter slide, as well as water bubblers and tumble buckets. Tubes are also available for rent for $4. The park offers lounger and deck chairs, shaded pavilions (extra cost), a covered dining area, and a full-service cafe. There is also a sand volleyball court. 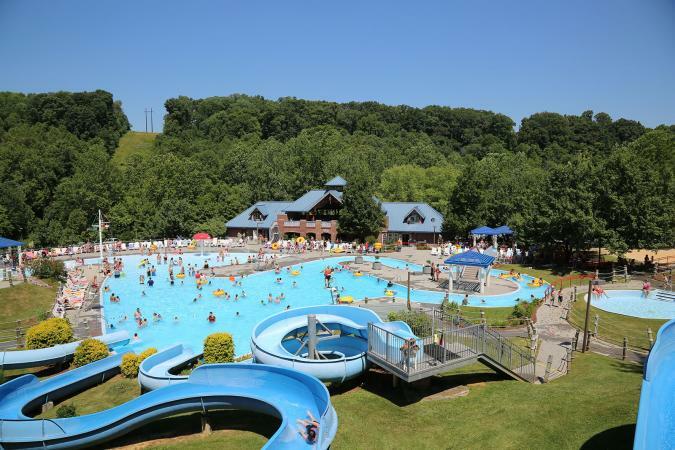 Cities most convenient to the water park, outside of Jonesborough itself, are Knoxville, Tennessee, and Asheville, North Carolina. The park's website offers driving directions. Note, the directions from Asheville differ slightly from those you'll find if you enter the destination into Google Maps. The Tri-Cities Airport is also an option for those flying into the area. The water park is only open seasonally from Memorial Day to Labor Day. They are closed the week that Washington County Schools begin in the fall, which is typically the second week of August. They suggest calling ahead to (423) 753-1553 to verify they are open if you're coming on a specific day. 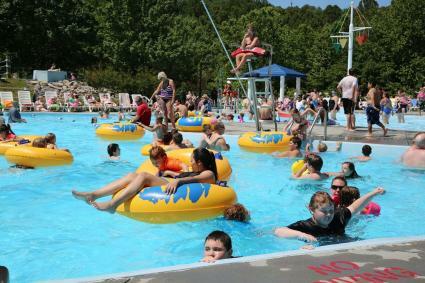 Hours are Monday through Saturday from 10 a.m. to 6 p.m., and Sunday from noon to 6 p.m.
Wetlands Water Park offers several ticket options depending on whether you want to visit for the day or visit multiple times each season. Admission day pass prices are as follows. Admission is half price for those arriving after 3 p.m. Unfortunately, even if you don't plan to swim, everyone who is four years or older must pay admission. Season passes are sold online, at the Visitors Center, and at the Water Department at Town Hall. Season pass prices are as follows. When the new season opens, check for discounted offers and special events scheduled online. There were some discounts offered during the 2017 season, so it's conceivable to think they will extend similar offers in 2018 and beyond. Be sure to follow them on Facebook and Twitter for potential discounts as well. Those wishing to host a private party or birthday party at Wetlands Water Park are in luck. Private parties can be hosted daily from 6 p.m. to 9 p.m. only. There is a two hour minimum, and the rates are as follows. Two hours for up to 200 people costs $600, three hours is $800. Additional people over 200 are $2 each. Additional non-swimming hours over the three hours are $100 per hour. There is a maximum fee of $1,650 for 1,100 people. Parties can be catered, or you can bring in your own food and drink. Lifeguards are provided at no additional charge. No alcohol or smoking are allowed. A 25% deposit is required with your mailed-in form to secure the date; dates are first come, first served. Those wishing to book a birthday party, versus renting the entire park out for a private party, can host a special birthday party from 1 p.m. to 4 p.m. daily. The minimum cost is $220 for up to 10 children, with each additional child being an additional $15. There is no outside food or drink allowed, and that includes bringing in a birthday cake. A deposit of 20% is required to hold your specific date. Wetlands Water Park offers swim lessons for $60 each session. Watch for 2018 dates to be announced. In years past, they have offered four sessions, and all persons who complete the entire session will receive a Certificate of Completion. Sessions are Monday through Thursday from 8:30 a.m. to 9:30 a.m. If weather causes a cancelation, the make-up lesson is that Friday. Those wanting to enroll their kids in swim lessons will need to fill out the application on Wetlands' website. Children 12 and under must be accompanied by adult 18 years old or over. Proper swimming attire must be worn and infants must have swim diapers. No outside food, drink, coolers, glass containers, chewing gum, or alcohol will be allowed into the park. It's a smoke and alcohol-free facility. No horseplay will be tolerated and all guests are expected to obey lifeguards at all times. TripAdvisor reviewers generally rate the park as a great experience, with some negative comments centered around the lack of additional shaded seating and the fact that the park needs to be updated. Most agree the park is well-maintained, with plenty to do, but small enough that you don't have to worry about losing sight of your children. Reviews on the staff vary, with some people noting the lifeguards really made it an extra special experience for their kids. One reviewer noted a large number of bees on the property when they were trying to eat, so that's something to keep in mind if you or your kids are allergic to bee stings. The lack of shaded seating is echoed throughout various reviews, so consider bringing a large brimmed hat, strong sunscreen, and a coverup. Another important point is the no refund policy for bad weather. One reviewer noted they got there, and the weather forced the closure of the park less than an hour later and no refunds were given. Keep that in mind since rain is frequent in the area. If you're looking for discount tickets, one person noted they received an active military discount through their local base, so inquire about military discount options if you're in the service. Travelers generally find this a fun afternoon spot to beat the local heat, especially if you have kids. If you're looking to spend the day in a small water park and enjoy a few rides, this is the place for you. If you're expecting something that rivals the massive water parks found elsewhere in the United States, you're likely to be disappointed. Given that this is a neighborhood establishment that has been in business for over 20 years, spending an afternoon here is a great way to support the local economy.